A vortex of despair and angst has settled over the Senators' fan base in recent weeks as their hockey heroes have stormed out of the gate to a surprising 10-5-1 record in their first 16 games, good enough for second place in the Atlantic Division. what went wrong in their OT win over the Flyers. PS. We stole this photo from the Senators' Twitter feed. Please don't sue us, guys. 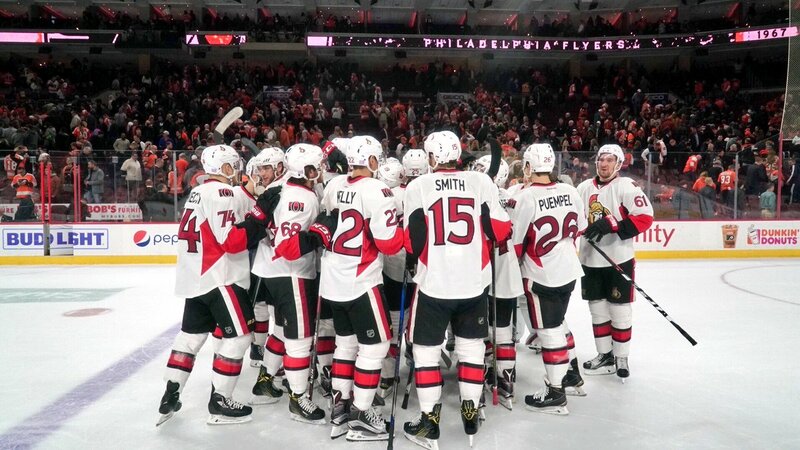 "I can barely stand to watch," tweeted one fan as the Senators rallied late to force OT and eventually win on the road in Philadelphia Tuesday night. "This team is so .... blah." The Senators have managed at least a point in each of their last four games, including a surprising win over the perennial powerhouse Los Angeles Kings. "They need to pull the trigger on a few deals, this roster desperately needs a shake up," commented one fan in response to another victory Vine gif video on the Sens' official Facebook page. "No wonder people aren't buying tickets to watch these lacklustre efforts!" The forboding blackness of eternal sorrow is most palpable at the Canadian Tire Centre, where poor attendance has been the norm during a home-heavy November schedule. The team's record in their own rink is 6-2-1. "Look, maybe if they string a few wins together I'll pony up for some stubs," mused one post-game show caller. "But they gotta show me they're committed to actually winning." Like a Poe verse come to life, the best years of Erik Karlsson's career are ticking away while the Senators are on pace for 107 points. The Florida Panthers won the division in 2015-16 with 103 points.